The key to losing weight is to be in a daily caloric deficit. This means you intake less calories than you burn each day. 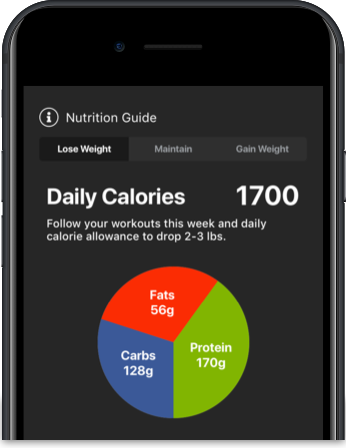 When you follow a plan in the app you will get personal calories to hit your fat loss goals shown on the Nutrition Tab shown under 'Lose Fat'. 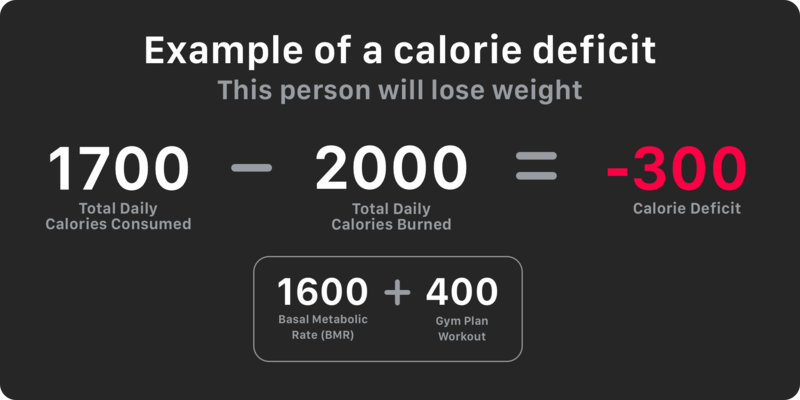 The app calculates your calories automatically including the calories burned from your workout plan. Saving you the time to calculate it yourself! Fat loss plans from the app are the most effective way to lose weight with or without free-weights. 3-4 workouts each week and you will make excellent progress. You can still lose weight while building muscle and this is the most popular type of plan with our members. They choose a Muscle Building plan and eat is a calorie deficit that is higher in protein to help maintain and build muscle while you lose weight. To focus on only losing weight (body fat) choose a fat loss only plan and follow the calorie allowance to lose fat (see the nutrition tab). To focus on losing weight and building lean muscle choose a muscle building plan and follow the calorie allowance to lose fat. To lose weight and lower body fat are two different things. What most people want in reality is to lower the amount of excess body fat they have to either look more muscular or toned. Muscle is denser than fat and takes up less space. When following our workout plans you are changing to body composition, strength and energy levels for the better. Therefore we advise for you to not to be concerned about how much you weigh on the scales and to instead focus on how you look and feel like. The more lean (toned) muscle you have, the more calories you'll burn on a daily basis. Your weight might not necessarily change much as you will lose fat weight but put on muscle weight. Obviously everyone is different, but you will look leaner and healthier. If you are training without the use of equipment, even bodyweight exercises will help you to build some lean muscle (although not as much as weight training). Food wise, keep it simple. To lose weight you have to burn off more calories than you eat each day as shown in the graphic above. One of the easiest methods to use for most people is tracking what you eat with a food tracking app such as MyFitnessPal. Or for many people who enjoy their food and don't want to have to think about what to eat we recommend Meal Prep Pro a meal planning app. Simply enter the calories we give you to match your training plan into either app and you'll be good to go! To lose weight eat less than you burn off each day. 300-500 calories is enough to see a steady drop in body fat. Give yourself enough time to see results, 4-8 weeks. Do not under eat lower than the deficit we give you, this will not work. Be consistent with with workouts and eating better (not necessarily perfect) and you will get longer lasting results.